Intestinal health has gained importance in recent years due to studies that showed the link between intestinal health and numerous other health conditions, (beyond gastrointestinal conditions) even to skin and allergic conditions. It is known that not all probiotic strains are effective and also not all probiotic supplements are of high density and quality to have an effect on intestinal balance. Today’s sponsored post is on LAB Fermented Extract, known as Biogenics 16 in Singapore. Questions are answered by the manufacturer and its team of medical professionals, an aspect which I appreciate as it showed the level of commitment and transparency. The key features of Biogenics16 and its impact on a child’s health are the focus of this 2-part blog series. LAB fermented extract is neither prebiotics or probiotics, but an extract of secretions and bacteria body substance of lactic acid bacteria from 16 high strength bacteria strains through a patented extraction technology. The 16 bacteria strains include L. acidophilus, L. brevis, L. casei, L. curvatus, L. fermentum, L. plantarum, L. rhamnosus and L. salivarius. It was observed by the late Dr Kazuyoshi Masagaki that ingested probiotic supplements do not survive well in body temperature and the acidic stomach environment, thus expelled as the body may not recognize it as its own. Instead lactic acid bacteria (LAB) fermented extract helps the body proliferate and grow its own good bacteria. At the same time, it also strengthens the immune cells, 70% of the body’s immunity cells are found along the intestinal walls. MarcieMom: I read your report that about 95% of probiotics ingested get destroyed by stomach acid and most probiotics degenerate at temperature more than 25 degrees C. It is indeed worrying as probiotics products are not cheap and if most of them get destroyed, it appears then it is of limited efficacy. On the other hand, Biogeneics 16 uses an organic, non-GMO soya bean broth as a culture medium, to cultivate and extract the friendly strains with patent technology to encourage the body to grow its own friendly bacteria while diminishing the bad bacteria. a. When we talk about probiotics, we usually talk about the strains to be at least in billions of colony forming units (CFU). What is the equivalent unit of measure for Biogenics 16? Biogenics 16 does not contain live bacteria. It is instead an extract of Secretions and Bacteria Body Substance of 16 strains of lactic acid bacteria that are clinically proven to increase natural growth of body’s own friendly bacteria effectively for better health. Thus, it is unnecessary to measure the forming units of bacteria. b. If LAB’s Fermented Extract is able to encourage the growth of good bacteria, why is it recommended to be taken daily? i.e. should it be taken more initially and when the gut is able to produce the good bacteria on its own, the dosage can then be reduced? Factors such as poor diet, stress, pollutants, prescription of drugs and antibiotics deplete the amount of good bacteria in our body while contributing to the proliferation of bad bacteria. The imbalance of intestinal flora may lead to many health problems especially constipation, indigestion and undischarged toxic waste accumulate and may leak back into the body. Thus, it is important to take LAB’s Fermented Extract daily so as to ensure the balance of good bacteria while continuing to inhibit the on-going growth of bad bacteria, in order to achieve optimum gastrointestinal health. a. We won’t know if a child is absorbing nutrients properly – do you have pointers where a parent can use to ‘gauge’ if the child has enough good bacteria? A healthy child with enough good bacteria does not fall sick as easily, has lots of energy, clear skin, bright eyes and a good appetite. His weight will also be within healthy range. In contrast, one with an unhealthy intestine tract has low immunity, bowel irregularities (constipation/diarrhea), is more lethargic and easily succumbs to allergies and infections. These symptoms can be indicators that your child does not have enough good bacteria in their intestine. b. How does having good bacteria in the gut translate to high nutrient absorption and immunity? And which of the 16 strains help with this? The small intestine is the place where nutrients are being absorbed in the body. If there are insufficient good bacteria in the intestines, the ecology of the good and bad bacteria gets upset. With insufficient good bacteria to digest food, bad bacteria take over and undigested food that is not discharged regularly from the bowels will clog up the gut. Undischarged wastes create toxins and cause the body and its vital organs to work harder and this creates stress on the body. Nutrients absorption is naturally compromised. Creating a conducive gastro intestinal environment to encourage the natural proliferation of the body’s own bacteria, which is the best fit for the individual as compared to foreign ingested probiotics. Suppressing bad bacteria. As the good bacteria flourish in the environment facilitated by LAB Fermented Extract, the bad bacteria colony shrinks and its reproduction is inhibited. Strengthening the immune system and Peyer’s Patch (an immune sensor of intestine) to activate immunity cells. (70% of entire body’s immune cells – Gut-associated lymphoid tissue (GALT) are located in intestine). The fermentation and maturation of Biogenics16 is maintained at a fixed temperature and humidity for a period of 1 year. The patented technology helps to deliver high quality and consistent active ingredients. The dosage is half a sachet for children two years and above, and 1 ml drop for children below two years old. Biogenics 16 is lactose-free and gluten free. MarcieMom: On the dosage for children, I’m curious to find out if (a) taking a full sachet will have side effects or will it be ‘wasted’?, (b) the effect of taking LAB Fermented Extract on alternative day as opposed to daily?, (c) what if the child is already taking fermented drinks like Yakult and Vitagen or already taking probiotics supplement? a) Biogenics 16 LAB Fermented Extract does not contain any live bacteria, sugar, additives, pesticides, colouring or flavouring, making it absolutely safe for children consumption. b) Observing your child’s stool is a good way to gauge if he/she is actually taking enough. Yellowish brown and odorless stool would indicate that your child is having good intestinal health, while dark brown with foul odor would mean otherwise. Through this observation, you will be able to better decide how much LAB Fermented Extract your child actually requires. c) According to Dr Hiromi Shinya, a pioneer of modern colonoscopic techniques and author of many bestselling books in Asia, taking fermented drink that contains non-resident (ie. Not the body’s own) bacteria are not fully effective in increasing the beneficial bacteria living in the intestine. This is because the live bacteria in fermented drink are not heat stable and as much as 95% of the bacteria are dead even before consuming. Thereafter, the remaining bacteria are easily destroyed when passing through our acidic stomach environment, or excreted in the stool if the body recognizes it as a foreign bacteria. Aside from that, fermented milk products may also contain high amounts of sugar, which is unhealthy for the child’s diet. Biogenics 16 is 100% resistant to heat and stomach acids. It encourages the growth of our body’s friendly bacteria while inhibiting the growth of bad bacteria, while strengthening the immune cells. Biogenics 16 is safe for all ages, including infants and elderly and in full compliance with the Japan Health Authority. There is no added sugar, preservatives, pesticides, artificial coloring and flavoring. Biogenics 16 is an established product, researched for 100 years and backed by clinical trials. MarcieMom: How long from the time it is manufactured can Biogenics 16 be safe to consume (product expiry)? And is there a certain period after which the product will degenerate? The shelf life of Biogenics 16 is 3 years from the date of manufacturing. Made from high potency with controlled fermentation process and patented extraction technology in Japan, Biogenics 16 provides LAB Fermented Extract that is highly stable and provides the same effectiveness and benefits for consumption by the date of expiry. Once again, thank you to Lifestream Group Pte Ltd, for sponsoring this series. 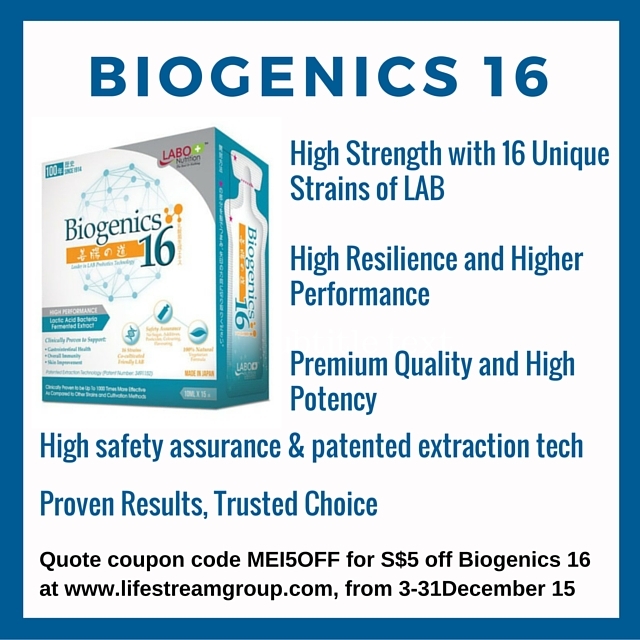 Get additional $5 of website price when you purchase Biogenics 16 at www.lifestreamgroup.com. Simply quote coupon code MEI5OFF upon check out to get the discount. Lifestream manages LABO NutritionTM under which Biogenics 16 is distributed. It is very useful information for parents and certainly help parents to be more aware of the child’s intestinal health and also in assessing products for it. Next week’s sponsored post will help readers of this blog understand how LAB Fermented Extract affects skin and improves eczema.